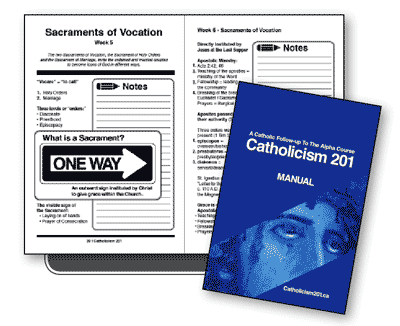 With over 100 pages, the Catholicism 201 Manual contains content from the DVD course, room for taking notes, a section of traditional prayers, the weekly course readings and much more. An ideal companion to Catholicism 201, this manual is an aid to participants' experience of the course. All prices are listed in Canadian Dollars. Applicable taxes plus shipping and handling charges will apply. Catholicism 201 takes 4-5 business days to ship to destinations in North America.